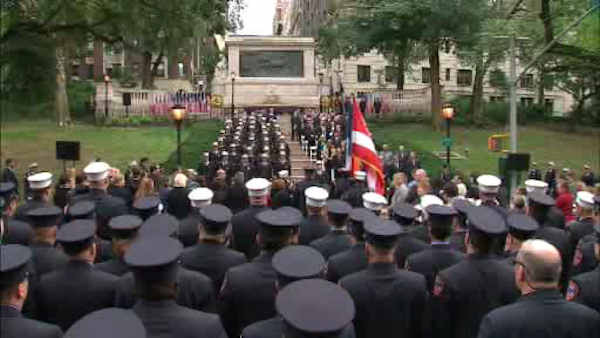 NEW YORK (WABC) -- The FDNY honored first responders who died as a result of working in the toxic rubble of the World Trade Center site after the September 11th attacks. The names of 21 firefighters were added Tuesday to the World Trade Center Memorial wall at the FDNY headquarters in Downtown Brooklyn. They join 89 others already on the list of those who died the day of the attacks. Officials say they all died from illnesses related to their work at the World Trade Center site. Meanwhile, more than 100 transit workers have been honored for their heroic work in the days following 9/11. MTA workers who served at Ground Zero after the attacks in 2001 were awarded medals from their union Tuesday afternoon. Officials say transit workers played a critical role, including iron workers cutting beams that cleared the way for the rescue effort, as well as bus and train operators who brought New Yorkers to safety and then ferried in first responders.